Goons in Portland, Oregon spray-painted a car with anti-Trump graffiti then torched it. The car had a small Trump sticker on it. A witness to the crime heard an explosion and saw a person jumping in place several times next to the car. A car was spray-painted with anti-Donald Trump graffiti and then set on fire in southeast Portland. A reward up to $1,000 is being offered to catch whoever did it. Police and firefighters responded to Southeast 9th Avenue and Ash Street at 12:28 a.m. Friday. They arrived to find a Ford Mustang on fire. After the fire was put out, investigators found “FK Trump” spray-painted on the side of the car. The car had a small sticker on it in support of the the president-elect, according to police. 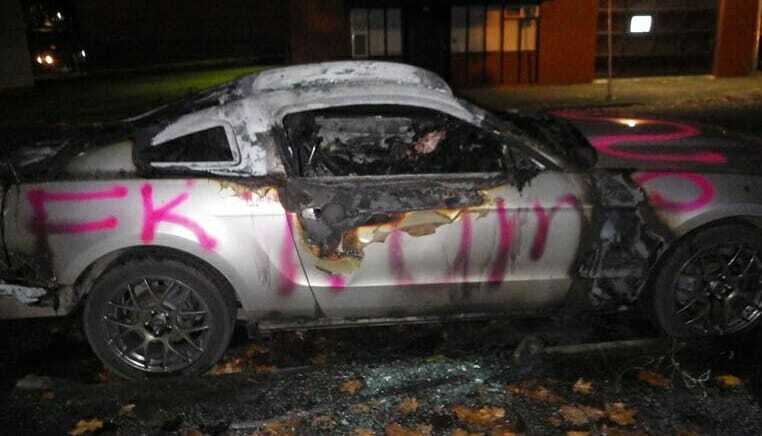 A Volvo parked in front of the burned Mustang had also been tagged with similar graffiti. A witness told police that he heard a possible explosion and saw a person jumping in place several times next to the Mustang. The person near the car then ran away southbound on 9th Avenue.